Y'all know I'm a budget beauty girl for life, but every now and then I get a chance to try out (or purchase!) a new "high end" product. I won't lie--if money wasn't an issue, I'd probably buy a lot more high end products than drugstore. 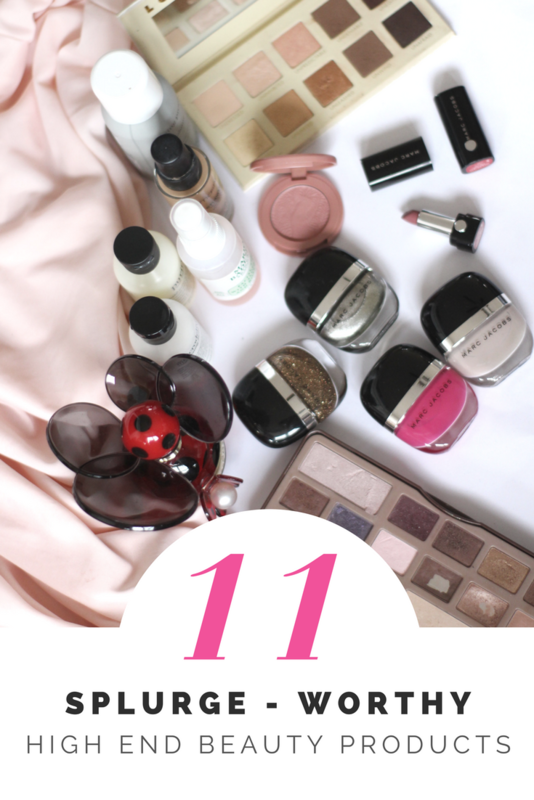 There are definitely some standout drugstore gems, but some things really are worth the splurge and today I'm sharing 11 of my favorite, if expensive, finds that are totally worth saving up for! Too Faced Chocolate Bar Palette // This was the first "real" high end makeup product I ever received! My mom got it for me for Christmas a few years ago and I have loved it ever since! You can see I've hit pan (and then some) on several shadows in this palette. There are a few colors here that I don't reach for, but overall this is a great staple to travel with (the new packaging is less clunky I believe) since it has lots of variety in one collection. I use it for warm shadow looks, smokey eyes, and every day neutrals, too! Marc Jacobs DOT Eau de Parfum // Ladies, if there is one beauty product in your life that you spend top dollar on, let it be perfume. You definitely get what you pay for when it comes to perfume and a large bottle can last a long time! Many designer brands are available at stores like TJ Maxx and Gordmans for a discount, too! This Marc Jacobs perfume is one of my favorite scents--notes of honeysuckle, jasmine, and vanilla make it perfect for day or night. Another favorite of mine is Viktor and Rolf Flowerbomb (I need to repurchase it now that I've run out)! Tarte Amazonian Clay Blush // I got this in the Sephora birthday gift last year and really love it! I use it almost every day and can't believe how long it's lasted! The formula is long-lasting, soft, and a little goes a long way--I haven't even hit pan on this mini size yet, so I know the full size is worth the splurge! LORAC Unzipped Gold Palette // One of my favorite Christmas gifts of all time! I use this palette almost daily. If you don't like warm shades this palette's not for you. The light shimmery shades make great highlighters and the darkest brown shadow is my go-to for natural smokey eyes. LORAC makes great quality shadows that are worth every cent! Marc Jacobs Le Marc Lip Creme // I bought a set of minis over the holidays and have completely fallen in love with this formula! The finish is a satin/matte and glides on like butter. It lasts several hours and fades really evenly. It's quickly becoming a favorite for me! Marc Jacobs Nail Polish // Ok, nail polish is like the last thing I would think about splurging on (I have a hard time even spending $10 on OPI), but I scored these beauties for under $5 a piece of TJ Maxx over the holidays and have fallen in love! The formula is opaque, long-lasting, and so smooth. I get an insta-worthy mani in one coat and it lasts well into the week, even without a top coat. It's worth every bit of it's $18 price tag and I can't wait to add a few more colors to my collection! These high end products may be pricey, but at the end of the day, they're totally worth the extra pennies! Do you have a favorite beauty product that you just can't live without? I'd love to check it out! Great list of products I need to check out. NARS is one of my favorite high-end brands for lipstick and tinted moisturizer. Love this! I always splurge on nail polish if I find one that won’t chip! That Tarte blush is my all time favorite! The Too Faced chocolate blush is awesome, too!